This newly built Villa (constructed in 2011) is a perfect example of the functioning symbiosis between the laid-back Mediterranean flair and history, and modern perfectionism. Villa Ancora is situated in the most noble and green district of Dubrovnik- Lapad. It lies in a calm neighborhood, far away from all the street traffic and hassle, and although it is protected by the trees of a surrounding forest, it offers an incredible view over the Gruž Harbor, and the monumental Franjo Tudman Bridge. The Villa lies in the heart of Dubrovnik- the closest sand beach and shopping center are only 5 minutes walking distance away. A walk to the Old Town only takes 20 minutes, or 10 minutes by bus. We are a family of three: Ivo, Jolanda with son Alen. We've been running our Apartments for over a decade, and the Villa Ancora since 2011, both of which have housed guests from all over the World! Reach out to us if you have any questions about our properties or about Dubrovnik & the region in general! 1 Master Bathroom with jacuzzi, 2 additional bathrooms with shower and 1 toilet. Modern leather ensemble, satellite TV, DVD player, LCD TV, wireless internet, music player. The villa has a regular filter and a Nespresso machine, please bring your own capsules for the Nespresso if you'd like to use it as they currently cannot be bought in Croatia. Modern and fully equipped kitchen: cooker, hob, fridge, freezer, washing machine, microwave, toaster, oven included. Notes on accommodation: Please contact owner. Outside: The villa has a terrace with stunning view over the Gruz harbor. There is also a private swimming pool on the terrace (8, 5m × 3m, 140cm deep). Seating opportunities and barbecue are also available. Additionally, there is also a Mediterranean garden. Utility Room: Washing machine, iron and ironing board & closet. Cleaning / Towels / Linen / Maid service: Towels and linen are available, property cleaning and towel & linen changing once a week. We couldn't wish for more. After a busy business week this was a well deserved retreat for me and my colleagues who chose to spend our final days in Dubrovnik at the privacy and relaxed settings of Vila Ancora instead of the 5 star hotel we spent a week at. It had everything you can wish for, the views are great, the property at a very high standard and the hosts are very kind, flexible and helpful. Wishing them all the best! Me and my new wife are recently married in the beautiful city of Dubrovnik and we had the most perfect wedding. We arrived on the Sunday and got married the following Friday so we had a weeks holiday before the big day. We stayed in the Villa Ancora with 6 of our friends and it is beautiful, modern, clean, spacious and is in a perfect location to see all that Dubrovnik has to offer. Ivo and Jolanda are very friendly, kind people and are always available if you need anything. 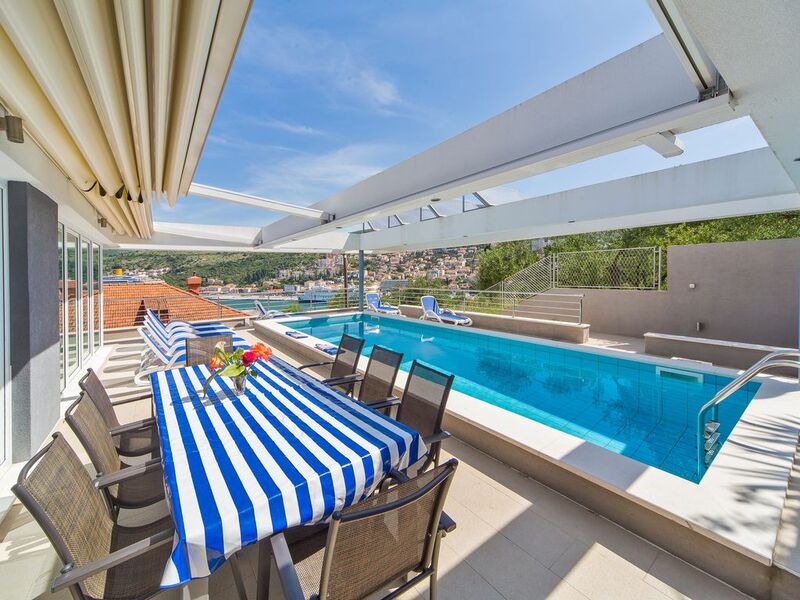 I couldn't recommend this Villa enough and a lot of our guests who stayed in various villas across Dubrovnik all agreed that ours was the nicest and very affordable split between 8 guests who all fit comfortably. The closest bay with multiple types of beaches (sand, stone) is only 7 minutes walking distance away from the Villa. Airport distance: 20 km. Transfer from airport available. Dubrovnik is a small town, therefore car hire would not be recommended. Taxi and bus services are fairly cheap. Walking distance to the Old Town: 20 minutes. By bus: 5 minutes. Closest shopping center (includes restaurants & banks): 5 minutes walking distance. Booking Notes: Deposit of 25% from the total price is required immediately after the reservation confirmation. Notes on prices: Please contact owner.